John Abraham's Satyameva Jayate put up a "decent" score on Saturday, Box Office India reported. The Milap Zaveri-directed film showed a drop in its collection on second day after "surprising" opening day collections. But the Milap Zaveri-directed film has registered a "decent" total on Day 4 - Rs 7.25 crore - and the film's total collection currently stands at Rs 40.75 crore, the report added. "The film showed a little drop as single screens where the film was registering good collections showed a noticeable drop but that is sort of expected after a good run for three days," Box Office India reported. Satyameva Jayate released on Independence Day with Akshay Kumar's Gold. John Abraham's film registered Rs 20.25 crore on the opening day. However, Gold managed to surpass the collection of Satyameva Jayate and currently stands at Rs 55 crore. Here's the box office report of Satyameva Jayate. #SatyamevaJayate saw a big dip on Day 2... Expected to show an upward trend today [Day 3]... Single screens/mass belt remains strong... Wed 20.52 cr, Thu 7.92 cr. Total: Rs 28.44 cr. India biz. #SatyamevaJayate springs a BIG SURPRISE... Plexes are good, but single screens are ROCKING... Wed Rs 20.52 cr. India biz. Satyameva Jayate also booked a spot on the list of biggest opening day collections of 2018. AkshayKumar's Gold also features on the list. Satyameva Jayate is on the fifth while Gold got the third biggest opening. Film critic Saibal Chatterjee, in his review for NDTV, gave Satyameva Jayate 1 star out of 5. "But this is John Abraham's comfort zone. Going on the rampage is all in a day's work, be it springing to the aid of a young man wrongly confined in a police station and tortured or a girl assaulted by a policemen. Veer might be a ruthless killer for a cause but he is a good guy with a good enough reason for his marauding ways," he wrote. 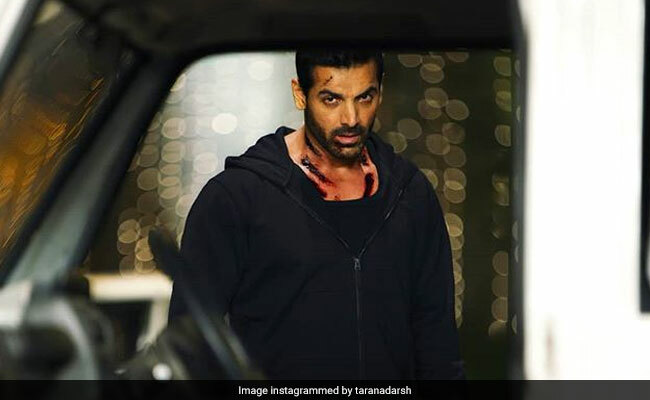 John Abraham returns to the masala action genre with Satyameva Jayate, which also stars Manoj Bajpayee and Aisha Sharma. The film is a vigilante drama, which has been directed by Milap Zaveri.